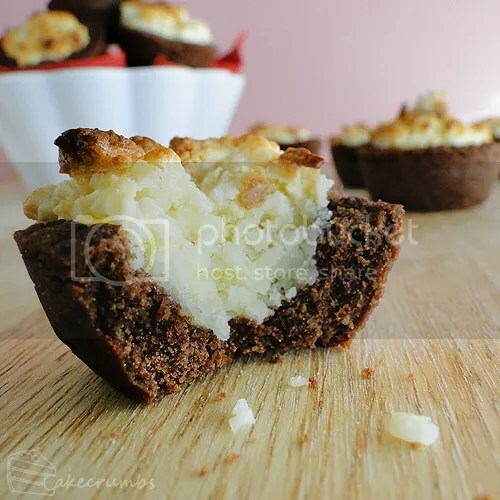 First up was my choice from the 12 recipes provided: Chocolate Coconut Cookies from Baking Glory. Not only did they sound delicious, but they used two ingredients I was keen to use up: coconut and cream cheese. In my laziness, I altered the method a little. Rather than flattening balls of dough in my hand, I rolled out all the dough between two sheets of baking paper, then used a fluted circular cutter to cut rounds from them. Some of the bakers on the Daring Bakers problem reported problems with the recipe flattening and not holding shape. I was really lazy with conversion and just used Aus cups cup-for-cup, meaning I had slightly larger portion of dry ingredients. so I probably ended up with a slightly stiffer dough. That perhaps aided the whole keeping shape deal. Some came out fine. But in others, where minor cracks had formed during the shaping of the dough, the cracks expanded and the filling began to spill out along with it. I opted instead to grease a mini muffin tray and bake the biscuits inside them to help them hold their shape a bit better. These biscuits were such a hit, wherever they went. I got about 40 biscuits out of the recipe and gave packages of them to different family members. Everyone adored them and went back for multiple helpings. When I bake, I'm usually keen to pass the results over to everyone else to try, but even I wanted to grab a second of these. Yum! For my next trick, I'd had thoughts of attempting something a bit fancy for the daring bakers. But really, how could I go past shortbread? No Christmas in my household is complete without them. That is, if the biscuits survive until Christmas. I couldn't help but give the shortbread a little festive twist. … whilst Rudolf became trapped inside the others. 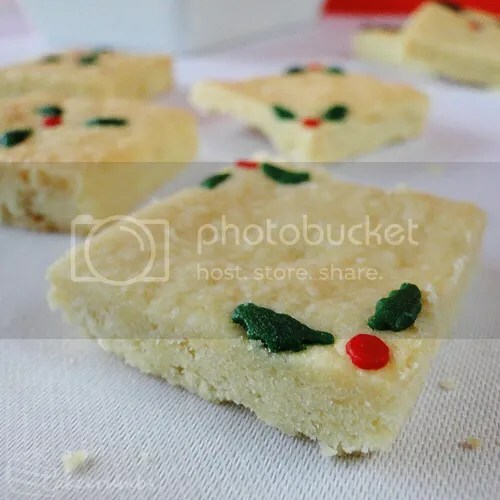 The shortbread recipe I used was a quick and easy version. A cheaters version, if you will. Since I don't have a food processor, and my pseudo-food processor died, the words "rub butter into the flour" strikes dread in my heart every time I read it in a recipe. It's exacerbated by the fact that I have long nails, which so get in the way when using this method. There are days I have a bit more patience and can deal with the rubbing method, but that was not this day. So I used a melt 'n' mix method. I'd avoided it in the past as I thought it would not yield great shortbread. 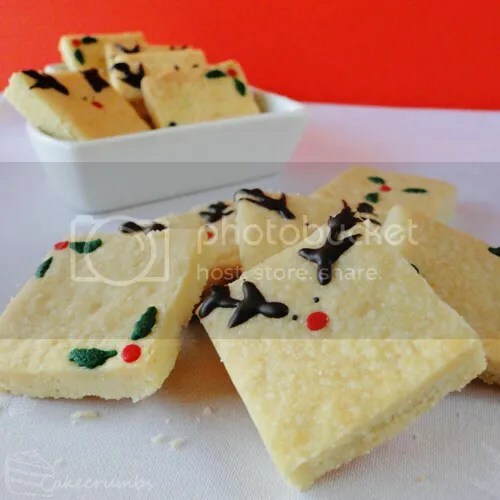 While you can't beat the original method, this shortbread is almost as good. Add to the fact that it is super quick and easy and any minute differences in the texture are erased from your mind. These were delicious, short and crumbly. everything that shortbread should be. To check out the 12 recipes we were given for the challenge, head over to Daring Kitchen. Meantime, here's my recipe for the shortbread. Melt butter in a pan over low heat, stirring. When butter is melted, remove from heat and allow to cool. Sift dry ingredients together in a bowl; add butter and vanilla essence and beat with a wooden spoon until mixture comes together. Press mixture into an 18 x 28cm lamington tin. You can use a straight sided glass to help even and smooth the mixture. 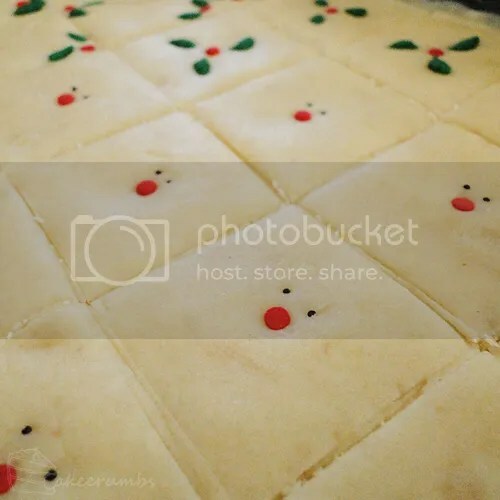 Using a sharp knife, mark the dough into squares; decorate as desired. If not decorating, prick with a fork. Bake for 15-20 minutes, or until light golden. Cut into squares while warm, then leave to cool completely in the tin. These were both very yummy. I especially liked the chocolate coconut cookies. I had to hold back on several occasions, from eating too many at once! That’s a big call, but you never know! I think this is the cutest shortbread I have ever seen. Rudolph is adorable! 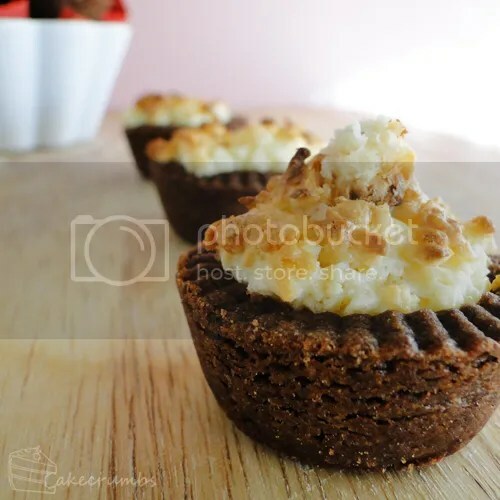 The chocolate coconut cookies look like 2-bite brownies, and you definitely can’t go wrong with those. Well done! Thanks so much! I have actually never heard of 2-bite brownies so I am going to have to go google that delicious sounding wonder. 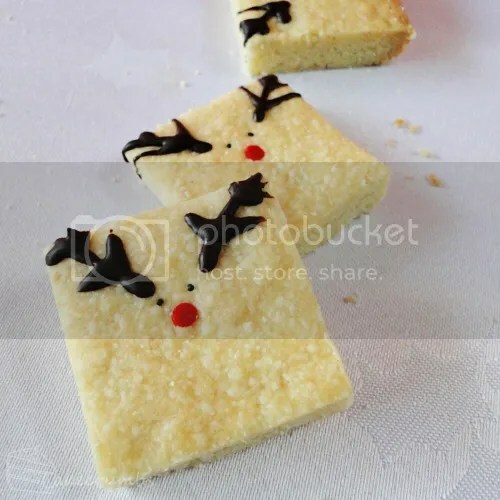 the rudolf shortbread are so cute! Great job! Both of your cookie varieties look so good! Those chocolate coconut ones… YUM – I want to try those. 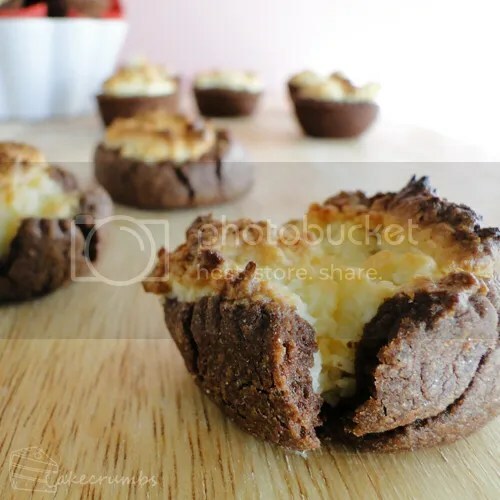 And I think the “lazy” way was actually brilliant – I will definitely use the muffin tin trick when I try these! Wonderful work. I love your cookies! 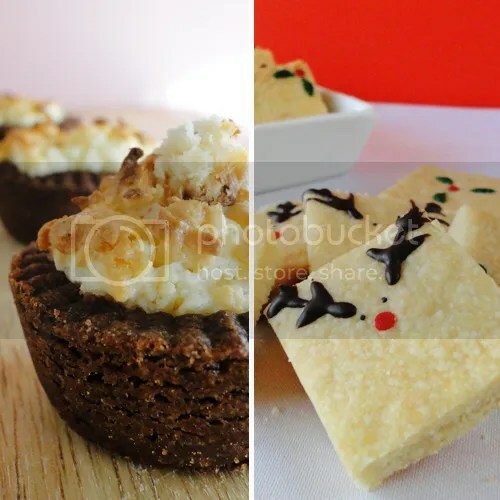 The chocolate coconut ones look delicious and the shortbread are so cute. I admired them when you posted them on the DB forum. Nice job on the challenge! 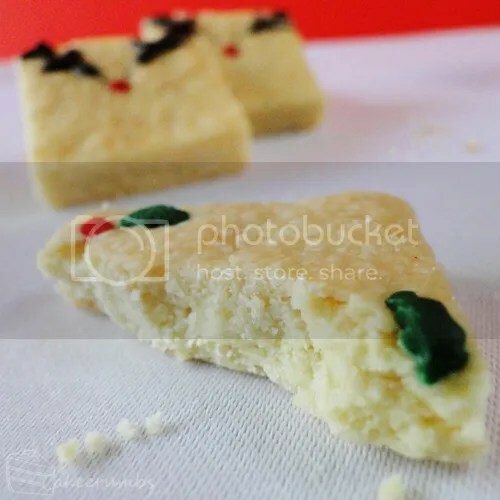 Your shortbread look so cute! And the chocolate coconut sound devine! I must try these!! Thanks! The coconut ones are definitely as amazing as they sound. I was expecting to be under-whelmed after being promised amazing things, but they definitely lived up to the hype! Both of your cookies look fantastic! 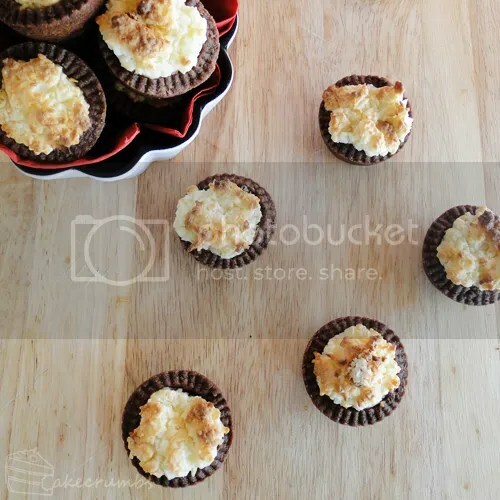 I love the chocolate coconut ones (brilliant idea using the muffin tins, sooo much easier!) and the reindeer shortbread are hilarious! Great job on both! Thanks so much! The muffin tin definitely takes the pain out of shaping them. I love your Christmas shortbread! I’ll definitely be making them in the Holidays.